This utility quickly adds new worksheets based on the information in your selected datarange. For each cell in your selection a new worksheet will be created and the cell content will be used for the name of the new worksheet. You can specify to use a certain worksheet as a source/template sheet. This way you can for example easily create 52 copies of that worksheet. If you use Excel version XP/2002 or newer then you can also specify to use the cell color for the sheet-tab color of the new worksheets. 1. Select a range of cells that contain the names for the new sheets. 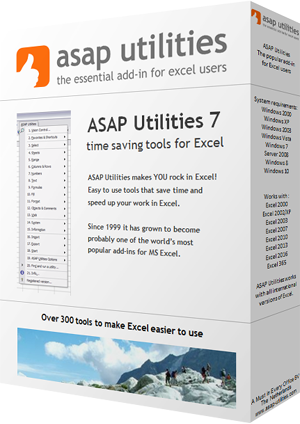 (You can use the "Quick numbering of selected cells" utility from ASAP Utilities, or Excel's built in fill tools to help you quickly create a list of names). 2. Start this utility, set the options and a sheet will be created for each and based on each cell in your selection.